Watch live at 22:00 Kyiv time on Channel 24. For Petro Poroshenko Bloc (PPB) member Serhiy Berezenko, the eighth convocation of the Ukrainian parliament was his maiden appearance in parliament, but obviously not the last one in his career. An active party functionary is rapidly gaining political weight: in just 10 years he has climbed up from the position of a Kyiv city councillor to the head of the president's State Affairs Directorate (2014) to a deputy head of the presidential faction. The influence of Berezenko is much talked about, but very little is known firsthand. 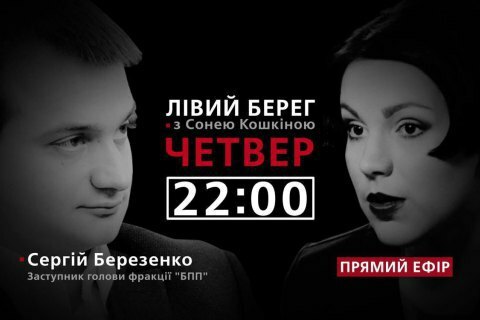 About the internal processes of political life, the reaction of the PPB to the most significant events in the country, important votes and the life of parliament today, Serhiy Berezenko will tell Sonya Koshkina on her Left Bank talk show on Channel 24. Watch live on 23 March at 22:00 Kyiv time. After the live broadcast, check out Sonya Koshkina's traditional Postscript section. MP: industry needs a "martial law"